I need to preface this review by stating that I absolutely love using electronic cleaning devices because they clean so much more thoroughly than my hands alone. I happily used my Clarisonic just about every single day, for the last 5 years, and probably would have continued to do so were it not for my newfound love of the FOREO LUNA Don't get me wrong, I still love the former, but the latter has unmistakably captured my heart in ways that I never expected. The Clarisonic did an exemplary job cleaning my face, and so does the FOREO LUNA, but the LUNA does so much more than just clean my face. The LUNA also has an anti-aging facial mode that actually massages the face and softens the appearance of fine lines. Furthermore, as you will see in my review, I discovered an added benefit that I never imagined possible during allergy season, and this may come as a surprise to allergy sufferers– but more on that later. While it is tempting to try to embark upon some sort of logical apples to apples comparison between these two devices– it should be noted that they are significantly different making a true comparative analysis nearly impossible. Their similarities rest on the fact that both are sonic cleaning devices for the face, and that is ultimately where their similarities end. That said, I will make every effort to compare them when possible. However, given that the LUNA has functions that the Clarisonic does not have there is no way to compare their relative functionality in those particular ways. Furthermore, the experience of using the LUNA differs significantly in the way that it feels against the skin since there is no removable brush head, but instead it has short and soft nubby silicone protuberances that gently massage the skin in a very different manner than the vibrating head of a brush with standard bristles (that exceed the length of the rounded silicone touch points of the LUNA). 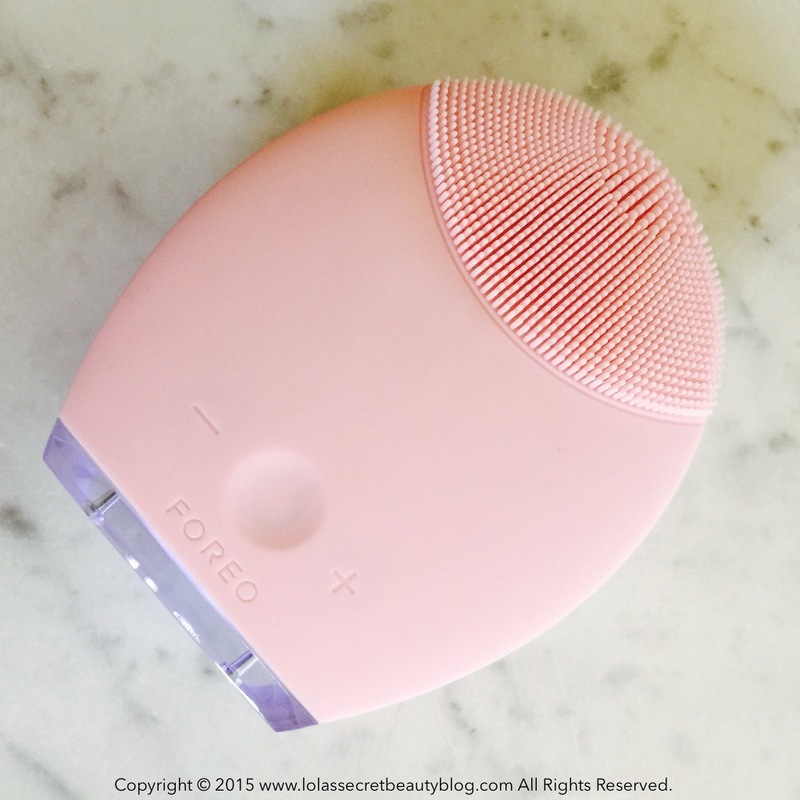 For a limited time, June 29 though July 6, FOREO is offering Lola's Secret Beauty Blog Readers a 10% discount plus Free Shipping. USE CODE: LOLASB at checkout to redeem your savings! 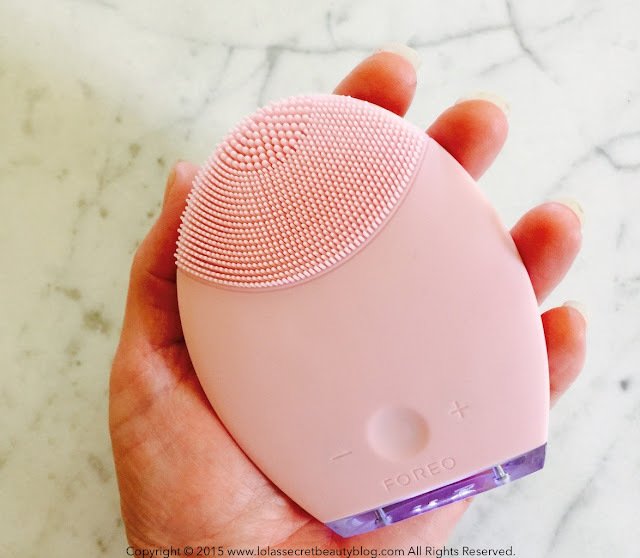 I want to extend a heartfelt thank you to FOREO for generously offering an exclusive discount to Lola's Secret Beauty Blog Readers. Nothing makes me happier than being able to facilitate great deals for you. What makes the FOREO LUNA unique? The LUNA takes a breakthrough approach to skincare by being the only facial-cleansing device combining T-Sonic pulsations to effectively cleanse the skin with a nonabrasive silicone brush that remains totally gentle and pleasant to use on the face. What's more, the LUNA even integrates an anti-aging function into its design to bring you a comprehensive beauty solution in one smart device. Unlike cleaning devices with removable brush heads, that only clean the face, the LUNA is a two sided sonic cleaner that offers added functionality. The brush cleaning surface effectively and efficiently cleans the face, but it also features a brilliant Anti-Aging Surface that treats wrinkle-prone tension spots. How do the T-Sonic pulsations work to effectively clean the skin? Up to 8,000 T-SonicTM (transdermal sonic) pulsations are channeled through the LUNATM's silicone touch-points per minute for a deep cleanse that is far more effective than using the hands alone. This gently removes dead skin cells, and unclogs pores of 99.5% of dirt and oil, along with 98.5% of makeup residue*, leaving the complexion looking radiant, healthy and naturally beautiful while helping to improve the absorption of your favorite skincare products. * Results from independent clinical testing. There is something tremendously visionary, and pragmatic, about altogether eliminating a removable brush-head that has to be replaced every few months, and that requires diligent cleaning to remove bacteria buildup. I also find that the LUNA'S cleaning surface, comprised of the rounded silicone touch points which are short and close to the base, offer a more efficient means of cleaning the skin. The Clarisonic has longer bristles that keep the base of the cleaner at a greater distance from the skin, and the pulsations are somewhat more diffused by its brush. The LUNA'S T-Sonic Pulsations, on the other hand, are transferred directly from the base unit to the face without this greater distance between the base and the tips of the bristles. While both devices clean the skin brilliantly, the pulsations from the LUNA seem to offer a built-in massage because of its intimate proximity to the skin, and the direct transfer of the full intensity of the T-Sonic Pulsations even when using the Cleaning Surface instead of the Anti-Aging Surface. How does the LUNA Anti-Aging System work? The LUNA directs lower-frequency pulsations through an arrangement of concentric ridges directly onto wrinkle-prone areas to smooth the appearance of fine lines and wrinkles, and leave the skin looking and feeling firmer and more elastic. I would argue that the anti-aging benefits of treating lines and wrinkles is a lovely benefit for using the Anti-Aging Surface of the LUNA. However, what I find equally advantageous is that this mode imparts profound relaxation as it likewise serves to effectively massage the face. It leaves me so relaxed and calm that I actually can't wait to use the LUNA everyday for this treat. Furthermore, I made a very happy accidental discovery, for which I am tremendously and eternally grateful: when I use the LUNA over my Frontal Sinus, Ethmoid Sinus and Maxillary Sinus I find that my sinuses open right when I am congested as a result of pollen allergies. While this is no cure for allergies, it does offer me some much needed relief. Why is a Silicone Brush More Effective than a Bristle Brush-Based Cleaner? Consisting of soft, rounded silicone touch-points, the LUNA's brush surface helps cleanse the skin deeply, yet in a much gentler manner than the sharp, oscillating brushes of standard facial-cleansing devices. The ultra-hygienic silicone design is also nonporous to resist bacteria buildup making it up to 35x more hygienic than bristled brushes, and the LUNA's silicone brushes are so durable that they don't require replacing. In addition to being more hygienic, the added benefit of not having to buy replacement brushes makes the LUNA more economical over the long run. It is not only the brush, in devices like the Clarisonic, that require cleaning, but also the area under the brush where it attaches to the base since it harbors tremendous bacterial build-up there as well. Given that there are no moving parts to attach and detach on the LUNA, it is much easier to clean, and its nonporous silicone body is far more resistant to bacteria than a detachable brush. I also always store my LUNA in a dry cabinet free from sunlight, moisture, or fluctuations in temperature. What is the best way to use the LUNA? 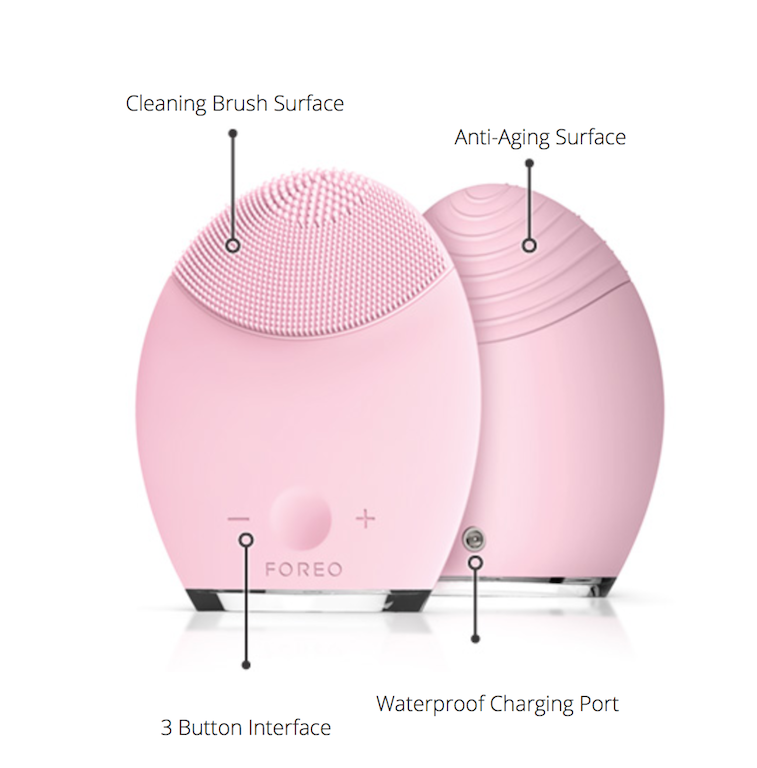 FOREO suggests using the LUNA for, "two minutes each morning and evening with your regular cleanser." 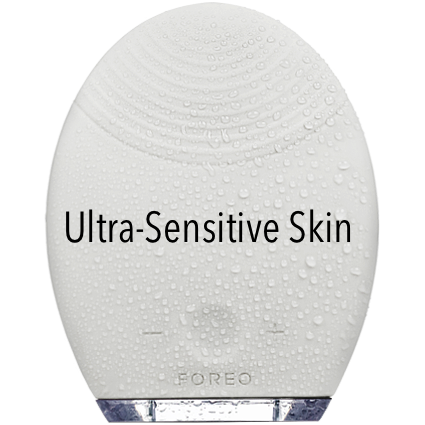 FOREO recognizes that this may not comport to the way that you like to care for your skin, and therefore they encourage modifying this recommendation to meet your own needs. I use it once a day, in the mornings, while I shower. I prefer this method to standing in front of the sink because it is less messy to use it on my face, neck and décolleté in the shower since rinsing is much easier than at the basin. FOREO is all about sustainable skincare. The LUNA not only refreshes skin instantly, but also keeps the skin clearer, brighter and healthier-looking from continued use for long-term results. I actually noticed that my skin looked cleaner, brighter and more luminous after using the LUNA for the first time. This is no exaggeration. Now I certainly would not have reviewed it based upon a single use, and I used it daily for over a month before I even considered writing about my results, but there is no question that I saw results immediately. That said, your skin may not respond as quickly as mine did. I should also state that FOREO makes three versions of the LUNA based upon skin type: Pink for Normal to Sensitive Skin; Blue for Combination Skin; and White for Ultra-Sensitive Skin. My skin can be sensitive at times, and it is normal to combination– therefore I decided to try the Pink one. I am thrilled with my choice, but at some point I would like to get the Blue one to use when my skin needs a cleaning surface that more assertively cleans combination skin. You will note in the pictures below that the pattern and size of the rounded silicone touch points differ between the three models. The first thing that I do before using the LUNA is to dampen my face and then apply my cleanser directly to my skin. If I use the LUNA in the evening, rather than in my morning shower, then I first remove all of my makeup and then dampen my face and apply my cleanser. I have also used an alternative method by applying the cleanser directly to the LUNA and then activating the lather with my fingertips before using the LUNA. Follow by wetting the LUNA’s brush surface, then turn on the device by pressing the center button once– which activates the Cleansing Mode. I tend to use the LUNA on my face for a full 2 minute cycle, and use it for 30 seconds on each zone of my face (forehead, nose and chin, right side of my face, and left side of my face). ￼￼1. Start cleansing your chin, move along your jaw to your ear using gentle upward strokes, then continue higher to cleanse the whole cheek. 2. Change to the other side of your face and repeat step 1. 3. Starting from the center of your forehead, cleanse the entire region with gentle outward strokes to both sides. ￼￼￼￼￼￼￼￼￼￼￼￼￼￼￼￼￼￼￼￼￼￼4. Cleanse one side of the nose by gently gliding the LUNA up and down, then change to the other side of the nose. Finally, delicately cleanse the under-eye region using outward strokes. FOREO recommends closing your eyes and relaxing your face when you use LUNA's Anti-Aging Mode. I actually close my eyes without even thinking about it when I use the Anti-Aging side of the LUNA– it's more of a natural impulse than anything else because it feels so good and is so relaxing that I just like to relish the experience. While I have a few expression lines, as opposed to deep-set wrinkles, I have definitely noticed that they appear finer and softer since using LUNA's Anti-Aging Mode. My skin also appears more lifted and radiant as well. I was initially so astounded by my results, but have now become accustomed to seeing the amazing effects that the LUNA has had on my skin. Not only is my skin cleaner than it was in my pre-LUNA existence, but it is also gently exfoliated every single day thanks to the thorough cleaning that it receives from this brilliant device. It also aids in loosening and removing debris that clogs my pores, and the few whiteheads that I get are quickly eradicated. The brush itself is soft, gentle and non-irritating– making it very pleasant to use. Furthermore, you don't need to apply pressure to enhance its ability to clean, all that is needed is a light touch and the LUNA will do all of the work for you. My skin is left luminous with a pronounced clarity, and that is before I apply any products to my skin! It appears to encourage circulation and to oxygenate my skin since I often note a healthy rosy glow after use (not to be confused with irritated skin). My skin is more luminous, radiant, even-toned, balanced and healthy since making the LUNA part of my daily ritual. Also, its ability to thoroughly clean the skin and remove dead skin cells and pore-clogging dirt and impurities allows serums, beauty oils and creams to absorb more deeply. Furthermore, clean and unclogged skin requires the use of less product, and therefore it is a far more economical approach to skincare long term. This is never more appreciated than when you are using expensive luxury products that can cost a small fortune to replace regularly. The Anti-Aging Mode visibly softens fine lines and appears to tone the skin. Skin appears lifted and more taut, and continued use really sustains and enhances the results. It also feels so good that it is the perfect way to relax and get centered. As extravagant as it may seem, I definitely want to get the Blue LUNA for Combination Skin to use on the days that I want to treat my oilier and more active T-Zone– not because this LUNA doesn't work well, but instead because sometimes I like a touch more friction that the LUNA for Combination Skin provides. In this scenario I plan to use the Pink LUNA approximately 5 days a week with the remaining 2 days devoted to the Blue LUNA. This certainly isn't something that anyone needs to do, but I am madly in love with the LUNA and want to be able to compare the two versions since normal to combination skin can be tricky to effectively treat, and I constantly seek to modify my skincare routine in order to maximize its efficacy. The sealed charging port is, "waterproof to a depth of 1 meter allowing for easy cleaning and use in the bath or shower." One of the noteworthy features is that the LUNA holds its charge for a remarkable duration of time. FOREO suggests that a single charge lasts for 7 months or 450 uses, but I have actually talked to people who have used theirs for an astounding 2 years on a single charge. I cannot weigh-in based upon personal experience since I haven't had mine that long. The LUNA fits perfectly in the palm of the hand, and the ergonomic design makes holding it comfortable and easy to use. The life span of your LUNA will be greatly increased with proper maintenance and care. Always clean the LUNATM thoroughly after use. Wash the brush surfaces with water and soap, then rinse with clean water. Pat dry with a lint-free cloth or towel. Never use cleaning products containing alcohol, petrol or acetone, as they may irritate the skin. Avoid using clay-based, silicone-based or grainy cleansers, exfoliators or scrubs, as they may damage the LUNATM’s soft silicone touch-points. Avoid leaving your LUNATM in direct sunlight and never expose it to extreme heat or boiling water. For reasons of hygiene, we do not recommend sharing your LUNATM with anyone else. Cleansing with the LUNATM should be comfortable – if you experience discomfort, discontinue use immediately and consult a physician. If you have a skin condition, please consult a dermatologist before use. Exercise particular care when cleansing the under-eye regions and do not bring the device into contact with the eyelids or eyes themselves. Close supervision is necessary when this device is used by, on, or near children. Never use the device, charger or charging cable if they are damaged. When charging, make sure the charger is dry, and do not charge the LUNA in any location where it or the charger may become immersed in water. Use this device only for its intended use as described in this manual. Given the efficiency of the FOREO cleansing and anti-aging routines, we recommend that you do not use the LUNA’s Cleansing or Anti-Aging Modes for more than 3 minutes at a time. Extra-Gentle Silicone: The smooth and soft silicone brush is nonabrasive enough for daily use. It is also nonporous to resist bacteria buildup, making it up to 35x more hygienic than standard sonic-cleansing brushes. Did you know that FOREO makes a sonic toothbrush called the ISSA? I have been in need of a new electric toothbrush, and given my exquisite experience with the LUNA, I am tempted to try theirs instead of getting another standard electric toothbrush. Have you tried the ISSA? Have you tried FOREO LUNA? If so, what are your thoughts? Press Sample Courtesy of FOREO. All views expressed are categorically my own (Affiliate Links). This sounds really nice! I like that they have different devices for different skin types! I'm so glad that you are loving yours and seeing results as well! Thank you, I'm glad that you liked my review and photos! I think you must have the most gorgeous skin: your luxury oils and serums and this device and your makeup! Absolutely my pleasure! The one for ultra-sensitive skin might be a really good solution for your skin! I definitely find the LUNA to be a more gentle system than the brushes on the Clarisonic. It sounds as though you had an allergic reaction to the mask that you used yesterday! What was it? How was your move on Friday? Are you happy with your new home in Albany? I realize that it will take a while to unpack and acclimate! This is an exciting new chapter! My skin is definitely in a god place right now, but it goes through ups and downs just the same! Excellent, in-depth review, Helen! Thank you for explaining this device to me. I have seen Foreo at Ulta and because of it's shape especially, I have been so curious about it. I like the idea of not having to replace brush heads. I would love to try this some day especially since they have them for sensitive and ultra-sensitive skin. I have just started using the new Michael Todd Soniclear that has an anti-aging mode, but I haven't used it long enough to have an opinion yet. I do feel kinda neat on my skin in that mode. Thank you so much, Allison– that means a great deal to me coming from you! I'm glad that my explanation clarified the way that the LUNA works. It's definitely really nice not having to replace brush heads! I have heard good things about the Michael Todd Soniclear, and didn't realize that it, too, had an anti-aging mode! What a fabulous review! I'm enjoying mine. I haven't been using it long enough to appreciate any visible difference in my skin but so far, I really like it. Hi Kristina! Thank you! It's definitely worth putting on your Christmas list– it really is an amazing device! The reviews on this device have been amazing! I have sensitive skin, so I have been weary of trying something like the Clarisonic, but this sounds so much better for my skin type! It's a very impressive device, in my opinion! I think that it offers a very good viable option for people with very sensitive skin that even the most gentle Clarisonic brush does not. It's definitely worth a try. I you might want to try the one for Ultra-Sensitive version, if you feel that the surface of the pink one has too many little scrubbies on it. The Foreo works really well on my sensitive skin. Love it! 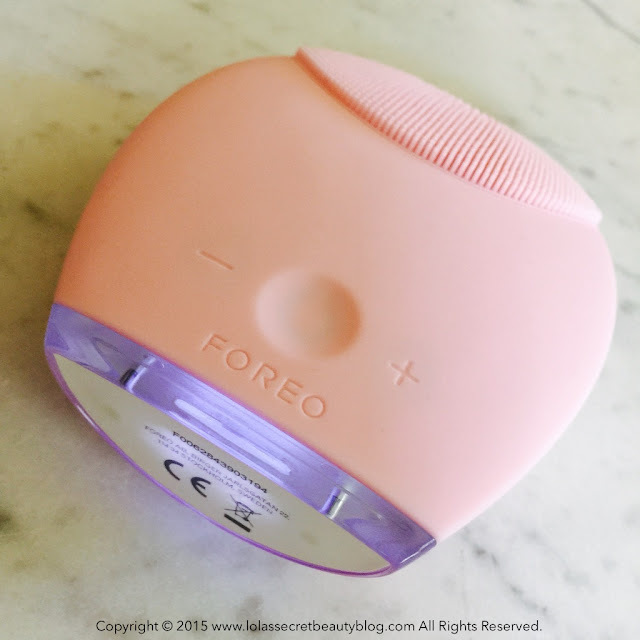 You were right long ago, when you told me of your deep and abiding love for the FOREO LUNA! Thanks, Jessica! It pleases me to no end that you loved reading my review! I felt like it was important to be as thorough as possible so people can decide whether this is worth the sizable splurge. My skin has definitely responded remarkably well to the FOREO LUNA, and I hope that the results to continue! 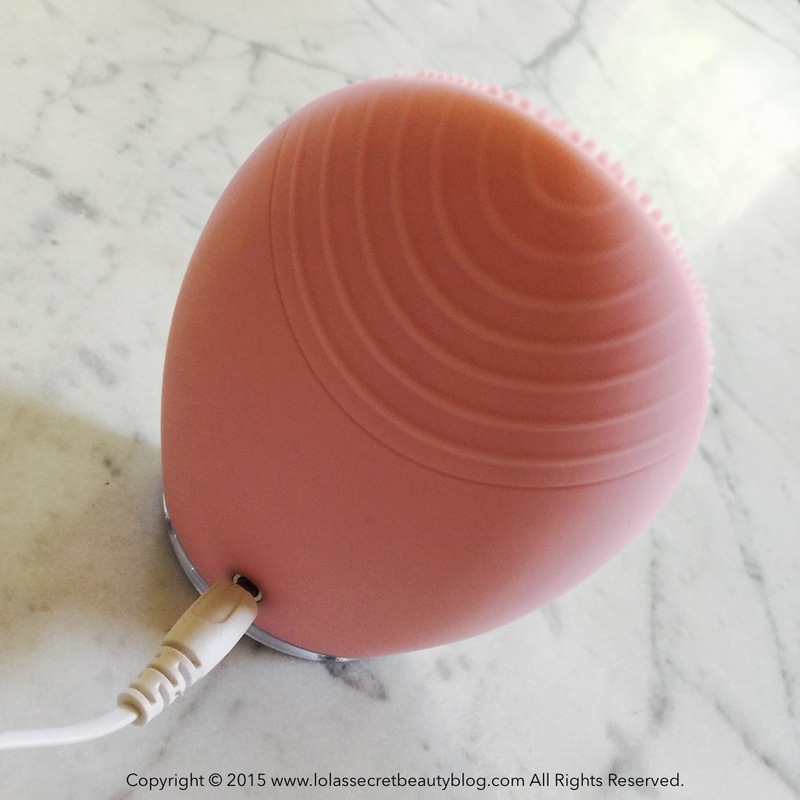 I love my Foreo but I misplaced the charger. I wonder if I can buy that separately. This is such a wonderful invention. You should get in touch with them to see whether or not they sell replacement chargers. I'm so glad to hear that you love your FOREO LUNA! It really is a wonderful invention! Another amazing review! I've officially decided to replace my Clarisonic with one of these when it dies. Thank you so much, Bailey! What a lovely thing to say! You just made my day! I definitely recommend checking the FOREO LUNA out, and I think that you will really be happy with it. You might wait a while, my Clarisonic is still going strong after more than 5 years! This did not work for me at all, I broke out and really feel my skin just cant handle brushes of any kind, it is always the same result. Glad it worked for you though! Wow! Do you think that you might have a silicone allergy, or is it that the friction irritates your skin? It definitely seems that you are much better off avoiding cleaning devices altogether! I have this one too and I love it. I have not had any issues with it at all.